The question is: How can you create a system to curate and collaborate on content that doesn’t require more people or waste your time? The answer lies in these 11 tools. Two reasons. First, because most of us already use Evernote for content marketing, including it wouldn’t be groundbreaking. Second, mastering Evernote can be daunting and it’s not a platform I can speak to with expertise. What I can speak to is the desire to automate social sharing without losing the human touch. The Quuu community submits unique social posts through Quuu Promote into categories that are reviewed by Quuu’s editorial board to ensure quality. Those posts are then shared automatically across your connected social accounts — Twitter, LinkedIn, and Facebook — or you can have Quuu send you daily suggestions to quickly sort through yourself. Both the automatic sharing and suggestions are based on your selection of relevant categories. But, what if you want to go beyond individual curation? Naturally, I’m a huge fan of Slack for direct sharing and company-wide communication channels. The struggle with Slack is that — without augmentation from plug-ins — it’s difficult to overlap with group collecting and direct social sharing. With a UI that resembles social networks, Smarp specializes in employee advocacy: the art of leveraging staff at all levels to become brand ambassadors. While that external focus is valuable, you can also set up Smarp for internal collaboration around categories or departments. By essentially creating “feeds,” marketers can more easily collaborate with subject matter experts within their companies to (1) solicit content for sharing or research, (2) start niche dialogues around that content, and (3) enable integrated social sharing either from official channels or by employees themselves. 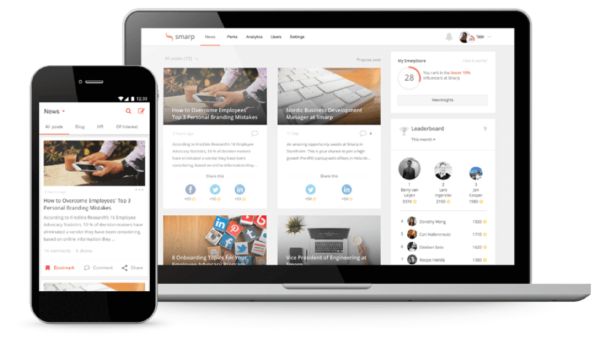 As a collection-and-sharing hub, Smarp excels. 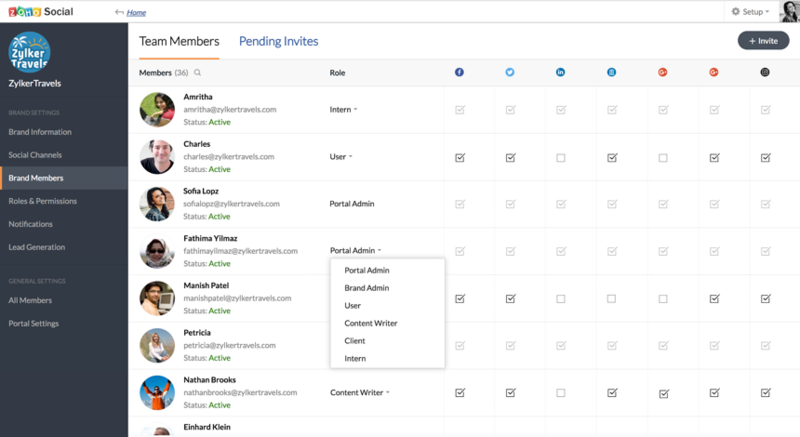 But what if you need more granular control over internal roles as well as external clients? That’s where Zoho Social comes in. Zoho is a full-scale social-sharing platform akin to Buffer or CoSchedule on agency-enabling steroids. For the purposes of this article, it’s the collaboration tool set that shines. On Zoho, for instance, you can set roles with corresponding access and permissions. 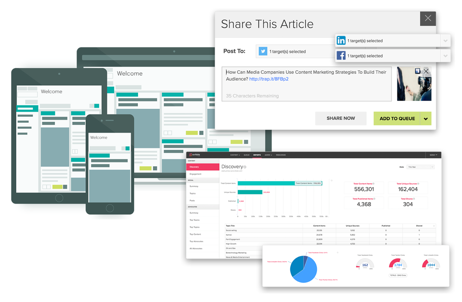 Clients can view and interact with shared dashboards, collaboration tabs, and reports, while staff — e.g., writers or social media managers — can alternate between open and closed conversations. Where the previous two tools excel as closed hubs for content curation and collection, Flipboard operates at the other end of the spectrum. With just over 100 million monthly active users in nearly 200 countries, its audience falls evenly along generational lines — millennial, generation X, and baby boomer — as well as gender lines. Built to be the content equivalent of Pinterest’s visual dominance, Flipboard is a robust platform not just for public-facing curation but for driving traffic. Pawan Deshpande, CEO and visionary behind Curata, knows a thing or two about content. 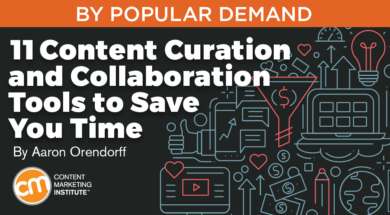 By having content curation involved in your company’s overall marketing plan, your company can save time, money, and resources. Without it, your company’s content marketers will be suffering from burnout. Content curation is the only way to go. 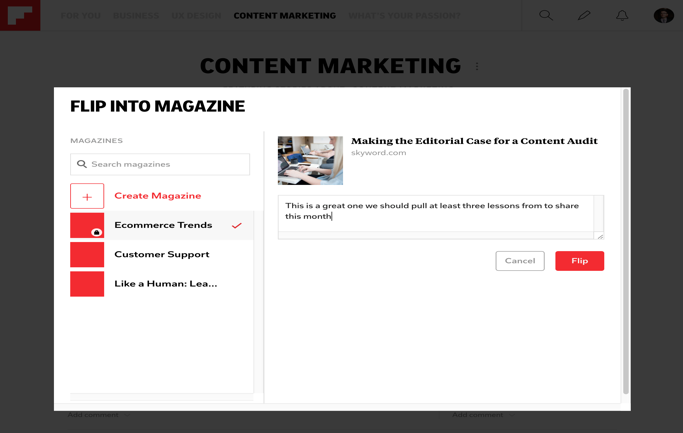 Curata’s content curation software — a paid service — guides you through the process of finding, curating, and sharing content to your target market with consistency and data-backed ease. Curata’s specialty is personalization. Discover and sort content served up from a smart engine. It’s this intelligent content technology that allows Curata to learn your interests and directly deliver content that’s valuable to you. 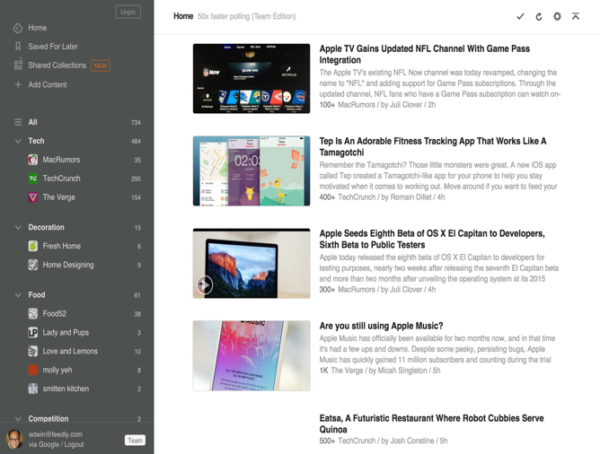 Following in Curata’s footsteps, ScribbleLive Trapit is another reader-learning engine. However, ScribbleLive’s specialty is tapping into the content curation and publishing power that most enterprise organizations overlook — their employees. By enlisting insiders for ideas and promoting content from the inside out, you can improve your organic following, influence, and overall reach. Boost your content marketing ROI by empowering people across departments to become advocates, evangelists, and leaders among their online circles. 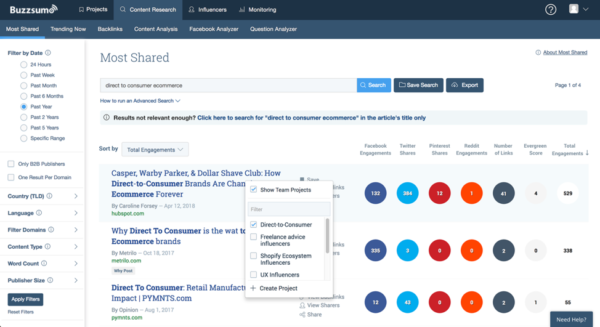 BuzzSumo is the mother of all social-measuring and virality tools. Back when I was targeting mainstream publishers for guest posting, it was literally my first stop in the research process. Projects let you not only collaborate internally, they also enable you to identify the top influencers in very specific niches to reach out for external collaboration. Plus, the Chrome extension works almost identically to Evernote with all the added benefits mentioned above included. If you’re unfamiliar, Scoop.it! grew up as a lowly algorithm destined to change the way content is promoted, shared, and curated. Since its 2011 launch, Scoop.it! has built a thriving community appealing to individuals and businesses alike. 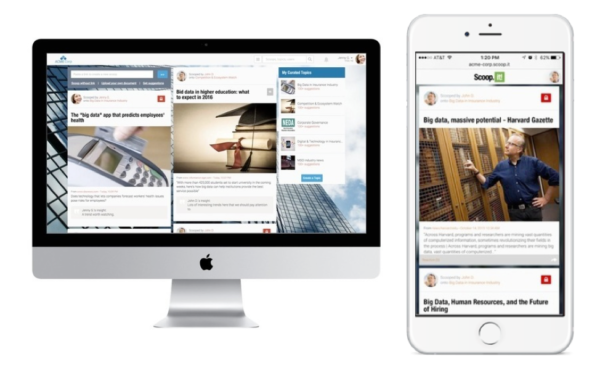 When you’re on Scoop.it!, you’re essentially surfing the web to find vetted and targeted content from and for your audience. You can then “scoop it” to publish either your own work or your favorite pieces from other sites. Instant, one-click publishing is what makes Scoop.it! especially valuable for content curation management. 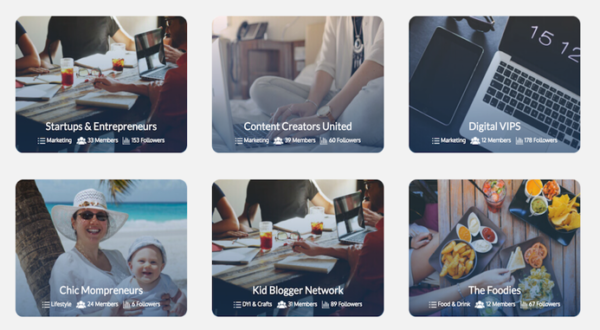 Not only does this create a digital paper trail to mine, but it also connects you with influencers in your niche. Feedly’s best benefit is its privacy feature. You can conduct your content brainstorming behind the scenes with your team. This is a huge bonus, as content creation success hinges on the ability of your team to work together. In fact, teamwork is the focus of the next tool on the list as well. Triberr. One of the non-obvious ways to promote content is to dive into a content community. Triberr is essentially a digital coffeehouse or corner pub, delivering readers to your content while exposing you to new content. Blogger communities can support each other’s content, inspire ideas, and drive traffic from one location. To be honest, I never would have thought to include Pinterest as a content curation tool. Sure, it’s a great marketing and community platform, but collection and curation? What makes Pinterest a powerful content curation machine? First, Pinterest is a direct connection to your audience. Follow your followers and your feed will hand you what they like. Second, Pinterest is visual. As you build a content library it can be easy to become fixated on SEO, keywords, and search queries. Pinterest reminds us that humans are creatures heavily reliant upon visual cues. Another great feature of Pinterest is that it can boost creativity when it comes to your content ideas. And — since the half-life of Pinterest content is three and a half months — your team won’t be finding stale material. Naturally, diving into all 11 tools for curating, collecting, and collaborating can be overwhelming. So don’t. The point is to simplify your process and find out what works for your content curation management needs. Curate hundreds of great content marketing lessons in a single location. Register today for Content Marketing World Sept. 4-7 and use code BLOG100 to save $100.